This church in the New Zion community of Clarendon County dates to 1801. During its first year, the congregation gathered beneath a brush arbor for worship. A log building was erected in 1802 on the current site, which rests “midway” between two other churches – Salem Black River and Williamsburg Presbyterian churches, organized in 1759 and 1736 respectively. (Midway Presbyterian’s proximity to these churches gave the congregation its name.) 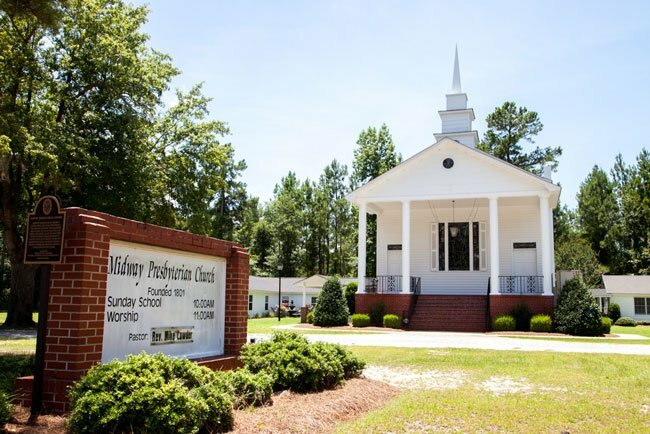 One of Midway Presbyterian Church’s first elders was John Witherspoon, a Presbyterian minister and the founder of Williamsburg Presbyterian Church. Midway Presbyterian Church received its official charter in 1804. One of the more well-known members of Midway Presbyterian Church was the Reverend Dr. Frank Harrington, who served as the senior minister of Peachtree Presbyterian Church in Atlanta, Georgia from 1971 until his death in 1999. Peachtree Presbyterian Church is one of the largest Presbyterian churches in the PC (USA) affiliation in the country. Under Dr. Harrington’s leadership, Peachtree Presbyterian grew from fewer than 3,000 in 1971 to over 11,000 by the time of his death. He was a graduate of Presbyterian College in Clinton.